Just as an orchestra would never play a symphony without a conductor, so too, there should be an MC at a wedding unless it’s a very small, intimate gathering of close friends and family. A larger reception will need an MC to ensure the smooth transition of events throughout the function. You may be a friend of the family or a relative or a business colleague. In some cases, you’ll be a professional MC. Generally, though, you’re chosen to be an MC at a wedding for a particular reason. It might be because of your personality. It might be because of your outgoing and friendly demeanor. It might be because of your public speaking experience. Or it might be the close relationship you have with the newlyweds or their families. The bride and groom are looking for someone who will make their celebration fun. That person will, ideally, be someone who has a sense of humor, is well poised, is able to handle emergencies without panicking, and who is at ease talking to a large group of guests. They want someone who will take charge and who commands attention and respect as they carry out their duties. Usually, the newlyweds don’t choose a Master of Ceremonies based on his or her experience, unless he or she is a professional MC. They simply assume you’ll know what to do, which is not always the case. Don’t be surprised if the newlyweds or the planners have little knowledge of your duties or what your role is. Ideally, they want someone who can take care of matters so they can celebrate one of the most important days of their life with their closest friends and family without having to worry about all of the little details. Normally, you’ll get some input as the reception is planned but it’s wise to count on having little in the way of direction about your duties and responsibilities. In fact, you may be asked for your input and ideas, especially how to make it a fun time. Your vision of how to conduct the celebration might be entirely different from that of the newlyweds or planners. That’s why it’s important to know what they expect of you from the outset. Don’t be surprised if they don’t give you too many details because they may only have a vague idea – at least initially – about what they want at their celebration to make it a fun time for their guests. The bride’s focus will be mainly on the decor, the table settings, the menu, the favors, and the seating arrangements while your focus will be on the timing of the various events and how they transition from one to another. Unless you’ve been an MC before and have some experience, chances are your idea about your responsibilities won’t be much more than being in charge of overseeing the events. Once the glow of being asked to be the Master of Ceremonies wears off, the reality sets in: You’ll soon realize that your duties and responsibilities are considerable and will have a huge impact on the bride and groom’s special day. You’ve been given the task to make the function a success. Your role is to be a leader and coordinator and in some cases to entertain without being the entertainment or stealing the show from the bride and groom on their special day. I cannot emphasize enough how important it is for you to be prepared and organized if you’re to MC a wedding. If you’ve been given plenty of notice it’s best to start early instead of rushing around in a panic a few days before the big day. That way you’ll enjoy the experience more and find it far less stressful. In general, though, it’s never wise to leave things to the last minute. There are far too many details and events to organize to be able to “wing it” at the last moment and expect things to run smoothly. In fact, even with preparation things can happen unexpectedly and you’ll be expected to deal with them in a professional manner. A specific blueprint outlining what’s required of you and a timeline to follow can be found in How To Be A FUN Wedding MC which will help guide you through the events that will take place. Start with getting organized. An agenda outlines all of the main activities throughout the reception – whether it’s a morning event, an afternoon event, or an evening event. Your agenda should have been created with the help of the bride and planners and approved by them so you and other key players know what to expect. In How To Be A FUN Wedding MC – the Wedding MC’s “playbook” for conducting a FUN reception – it’s recommended to go onsite well before the “day of” and check out the venue and introduce yourself to the functions manager. You’ll want to know the layout of the room or hall and get a “feel” for it to visualize how it will be set up for the celebration. You’ll want to know whether there’s a lectern and what the arrangements are for a microphone and audio visual equipment, if that’s needed. You’ll also want to know where the parking is, the restrooms are, the coat check room is, as well as who your main contact will be leading up to and on the day of the celebration. Ensure you have a timeline for the events. Keep in mind the venue will be rented for a specific length of time and you want things to be on time, otherwise surcharges could be incurred or the function may have to end early to accommodate another party who has booked the room immediately following your event. Your timeline will usually start with the cocktail hour where there’s an informal gathering of guests and drinks (alcoholic and/or non-alcoholic) are served before the main meal. From there your timeline will progress from one event to another to the final farewell. You’ll want to know when to seat guests before the bridal party is introduced and you’ll want to know what events – if any – will take place before the main meal. Allow plenty of time for the guests to be seated before the bridal party is introduced and the Grand Entrance begins. One of the most important events is speeches and toasts which will have a particular order – whether it’s a traditional order or not – that is approved by the bride and groom. Keep your introductions of speakers brief and also follow the schedule of speeches closely to ensure they don’t drag on and use up time reserved for other events. On the day of the wedding, you’ll want to ensure the room or hall is open and that guests know where to go once they arrive at the venue. That might require signage or a general announcement or a greeter as guests arrive. You’ll make contact with the functions manager or caterer and go over the timeline for the cocktail (pre-dinner) gathering and when you expect the meal to be served. You’ll also introduce yourself to the DJ or band leader, planners, head of catering, and any other key players and support staff. It’s critical that these key players are also aware of timelines and any special requirements. For example, there will usually be certain music requirements throughout the reception. The DJ or band might be expected to provide music as the bridal party enters the room and during the Grand Entrance. As well, the bride and groom will likely have requested a special song for the first dance or bridal dance. Music might also be required during the meal or other events and there may be special requests (including a do not play list) during the dancing segment. The caterer will also need to know the approximate time to serve the main meal. Be especially aware of potential delays with the newlywed’s arrival. It’s not uncommon for them to be delayed because of photographs being taken and that can quickly throw off your timeline. After the guests are seated you’ll introduce yourself. Your MC speech is completely different from – and not to be confused with – the normal speech which pays tribute to the bride or groom. From the outset your intention is to warm up the audience and create a fun atmosphere, a technique which you’ll find in How To Be A FUN Wedding MC. After introducing yourself, and before things get underway, you’ll inform guests of the events that will take place as well as providing general “housekeeping” comments regarding restrooms, smoking areas, and any special requests from the newly married couple or from the venue’s management (dancing on the tables is frowned upon). One key point to remember as Master of Ceremonies is to make sure you have the order (and the names) of the bridal party correct. You should introduce yourself to the members of the bridal party and ensure your notes correspond to introductions you’ll be making. The bridal party – as well as close family members – are particularly important to the newlyweds and deserve (and should have) special introductions and acknowledgements. The agenda and run sheet will dictate what events take place after introducing the bridal party and the newlyweds. Those events can include speeches, dancing, cutting the cake, the garter toss, the bouquet toss, and the final farewell although these events are not mandatory and are up to the bride and groom and planners. The planners may be the mother of the bride, the bride, as well as a professional planner. One of your first tasks as an MC at a wedding will be to meet with the planners to find out what is expected from you and to gather information about the reception. This is also where you will start preparing a tentative agenda or run sheet. The background information you obtain will help you with remarks you make during the various events. You’ll also want information about their childhood, courtship, and engagement. And you may want details about their forthcoming honeymoon. Unless the bride and groom specifically request no toasts or speeches, there will be guests who will give toasts and speeches. Usually, as a minimum, the speeches and toasts will usually be made by the best man, the father of the bride, and the maid or matron of honor. Other family members including the Mother of the Bride, the Father of the Groom, and the Mother of the Groom may also make a speech or toast and other guests may be called upon to say a few words. The information you gather about the speakers will help you introduce them during the reception. The introductions don’t have to be long. Ideally, though, the introductions incorporate something that shows the relationship to the newlyweds and could include humorous comments, if appropriate. The agenda is your timeline of events and will be prepared in consultation with the planners. From the arrival of the guests to the speeches and toasts to the final farewell, this will be your guide to keep things running smoothly and on time throughout the reception. While it’s customary to think of the agenda and the run sheet as being one and the same – and there’s nothing wrong with that – there’s a finer distinction in practice: For your own purposes your run sheet is much more detailed than the agenda. The agenda highlights the events. The run sheet shows more detail for you to follow throughout the various events. Where the agenda will say, for example, “Speeches and toasts,” your run sheet will indicate on your notes: Who the speech or toast is to, the name of the speaker, and background information for introducing the speaker. Now that you have your background material on the couple and the speakers it’s time to put everything together. You’ll need to prepare your MC Opening Speech, introductions for the speakers, games for the guests (in consultation with the bride and groom), jokes and humorous stories (if you’re going to use them, although it’s not mandatory in order to have a fun celebration), and anything else that is entertaining and keeps the events running smoothly. You’ll find many more details on fun games and entertainment in How To Be A FUN Wedding MC. Apart from reviewing the venue as part of your early preparation, if there is no planner overseeing things, it’s a good idea to ensure room set up and decorations are scheduled to be completed well before the guests arrive. This is a critical detail that is often overlooked. From the seating arrangements to lighting to catering to entertainers…everything must be checked beforehand to ensure things go smoothly throughout the reception. I realize this is the tip of the iceberg and a mere glimpse of your duties and responsibilities. Chances are you’ve got a lot of questions on what to do and how to get started. 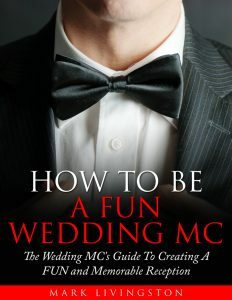 If you’re a novice MC who doesn’t know what to do, where to begin, or what to say, then How To Be A FUN Wedding MC will walk you through your duties and responsibilities from start to finish…just as it has for hundreds of other novice MCs who have gone before you. You’ll find complete details including preparation sheets so you don’t miss important details, sample agendas that can be easily modified, a timeline to keep you on track of things, fun games and entertainment ideas (everything is laid out for you), helpful checklists so you don’t forget anything, and much more including – and most importantly – how to create a FUN celebration for the bride and groom. 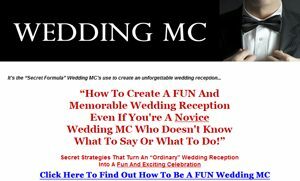 Click the following link or the image below for How To Be A FUN Wedding MC .